Abstract : We present a novel methodology for the analysis of complex object shapes in motion observed by multiple video cameras. In particular, we propose to learn local surface rigidity probabilities (i.e., deformations), and to estimate a mean pose over a temporal sequence. Local deformations can be used for rigidity-based dynamic surface segmentation, while a mean pose can be used as a sequence keyframe or a cluster prototype and has therefore numerous applications, such as motion synthesis or sequential alignment for compression or morphing. We take advantage of recent advances in surface tracking techniques to formulate a generative model of 3D temporal sequences using a probabilistic framework, which conditions shape fitting over all frames to a simple set of intrinsic surface rigidity properties. Surface tracking and rigidity variable estimation can then be formulated as an Expectation-Maximization inference problem and solved by alternatively minimizing two nested fixed point iterations. 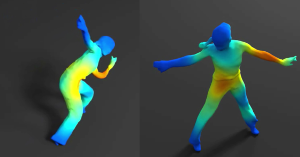 We show that this framework provides a new fundamental building block for various applications of shape analysis, and achieves comparable tracking performance to state of the art surface tracking techniques on real datasets, even compared to approaches using strong kinematic priors such as rigid skeletons.